A pre decimal coin minted in 1961, the year of Diana’s birth. 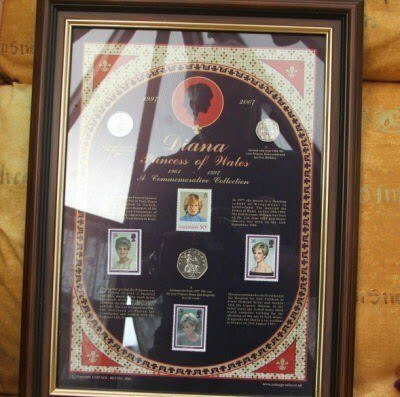 A decimal coin from 1982, the year Princess Diana celebrated her 21st Birthday. Being the youngest daughter of the then Viscount and Vicountess of Althorp. She was educated at Diss in Norfolk and at West Heath in Kent. In 1977 she moved to a finishing school at Rougemount in Switzerland. She married the Prince of Wales on July 29th 1981. She had two sons. William was born on the 21st June 1982 and Henry (Harry) was born on the 15th September 1984. During this period the Princess was the Patron of over a hundred charities, much of her work being involved with the homeless, children, the disabled and also HIV and Aids. She was divorced in 1996. She continued as Patron for Centrepoint and worked with the National Aids Trust. A decimal coin from 1997. This was the year Princess Diana died tragically in a car crash. She also continued as the president of the Hospital for Sick Children at Great Ormond Street and worked with the Leprosy Mission. In her later years she visited many third world countries working for the abolition of the use of land mines. Tragically she died in a car accident in France on 31st August 1997.